It’s an inspiring scene, and one we’ll no doubt be seeing played out more and more. Though at the same time, I can’t keep myself from wringing my hands over how long it has taken us, and how much further we have to go. We lose an valuable opportunity every time we put up a new building without rooftop photovoltaic (PV) and solar hot water systems like those those being installed in the photo above. The twelve panels that make up the PV system — provided by Puget Sound Solar — cover about 150 square feet of the roof. Rated at 2.4 kW total, the panels are expected to produce about 2,800 kWh of AC electrical energy per year. The solar hot water system is estimated to produce about 2/3 of the hot water needs for a typical two-person household. As of 2005, the average household located in the pacific division of the western census region consumed 21,000 kWh/ per year total energy, of which 8,500 kWh was electricity. So matching annual household electricity use would require three of the above-described PV systems, and 450 square feet of roof. For comparison, a typical townhouse footprint is about 800 square feet. Offsetting the entire household demand to achieve net-zero energy use would take 7.5 of the PV systems and 1125 square feet — too large an area to fit on a townhouse roof. The point is that rooftop PV has the potential to produce a big chunk of household energy use in low-rise buildings, even with Seattle’s less than ideal solar input. But of course the catch is PV has high up front cost, and relatively long pay back periods. A 2.4 kW PV system like the one noted above costs in the neighborhood of $20,000. 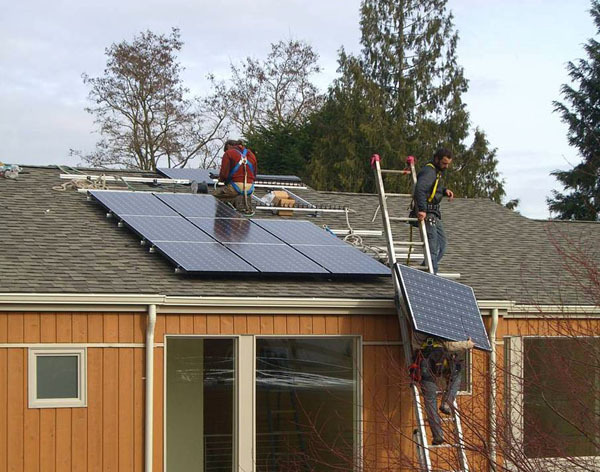 Washington State law mandates authorizes utilities pay up to 15 cents per kWh generated by PV, and there is a 30 percent federal tax credit available for the purchase of PV systems. Applying those two factors yields a 33 year payback. We need better incentives. Can anyone out there tell us if the new stimulus package will help? Posted by dan bertolet on	Tuesday, February 17th, 2009 at 12:28 am. You can follow any responses to this entry through the RSS 2.0 feed. You can leave a response, or trackback from your own site. I think you are seeing here one of the reasons why megaprojects for this kind of thing are a bit more attractive. Building a large, centralized version of something like this is expensive, yet something government – itself a large, centralized thing – can easily handle. But when the small, decentralized solution costs people $20k+/pop . . . There are more variables involved and it won’t take 33 years now that we have the 30% federal tax credit. Also a difference based on which power company you use. Base rate a City Light is 4 cents kWh but PSE is twice that. What if you are charging an electric car with that solar energy that your home is making, no longer spending $4.00 a galloon for gas? You will pay for those solar panels even quicker. And FYI state law does not mandate that utilities participate in production credit, it is voluntary. The big guys have signed on but not the smaller. [Pamela] Well, you’d be saving most of the $4 in gas even if you used grid electricity, so that’s not a great point. I think solar has potential, but let’s not get crazy. The 33 year payback is after quite a bit of incentive. Cost is a reasonable metric for embodied energy – if these things are so expensive to build, then it probably took a lot of energy to make them. I’d much rather see concentrated solar thermal power built in large quantities – these use simple materials (mirrors, basic control motors) along with an efficient power plant to generate energy and potentially thermal storage to shift generation peaks. Of course the easiest way to decrease the payback period for any sustainable technology is to recognize the true cost of fossil fuels. A simple carbon tax on fuels would suddenly make everything else much cheaper in comparison. PB @2, thanks for the correction about the State law — it’s been updated in the text. The 33 year payback was caculated by subtracting 30% off the $20k cost and assuming the 2800 kWh/yr is worth 15 cents/kWh. MTE @3, yes, CSP plants are great too, but they do have the drawback of transmission line loss, and we’d need to seriously beef up the grid to get the power from the sunny states to the not so sunny states. If you know of a good analysis on the life-cycle cost (i.e. embodied energy etc) associated with the production of PV panels, please pass it on. No doubt it’s another case of no silver bullet solution. CSP would work fine in our state, just not as well as in California. But then that’s true for PV as well. Sadly I don’t know of anyone that’s studied the embodied energy of a PV system, hence using the extremely imprecise but easy tool of cost. But regarding your precise question – life cycle cost, that’s easy. They typically are assigned a lifespan of around 30 years. Given a payback of 33 years that makes them almost free (after incentives). But then technologies with better paybacks are better than free – they actually save you money. Which makes this a good time to point out that I’m not at all against PV. I just think it’s something you do once you’ve exhausted the better options (good insulation, efficient lighting, efficient heating/cooling, hybrid or no vehicle, etc.). I just worked with one project where almost everything paid off – hot water cogeneration, ground source heat pumps, solar hot water, black water recovery, exhaust air heat recovery to name a few. But PV’s just didn’t pencil out. That doesn’t mean PV would have been a bad idea, but it would have been a shame to add PV instead of all of the other features and end up using more energy. The cost of utility supplied electricity will go up over 30 years, the cost of the electricity from your PV will not. Resale price of the house should increase accordingly. $20,000 is the cost of a new bathroom or a cheap auto in today’s dollars. The PV will still be running in 30 years, the auto will be long gone, and the wife will have had you remodel the bathroom at least once. A well-known study from a few years ago concluded that the typical PV module erases its energy footprint in about 4 years. Modern UL listed PV modules are expected to last for 50-80 years. PV pencils out just fine. If your utility is PSE, it takes about 16-18 years now, due to rate increases. By comparison, people have been arguing about whether or not solar ‘pencils out’ for decades (during which time many solar energy systems ‘penciled out’). Solar energy systems are the only home improvements that add value to the home and then go on to pay for themselves as well! Never posted a comment here before, but I am a big fan of this site. I don’t check it as often as I mean to, hence my 10 day-old reply (= 10 months in blog time). So, since you asked a direct question: yes the stimulus will impact this, mostly indirectly. The federal renewable energy tax credit is indeed going up, but more importantly, $3.2 billion was allocated to the Energy Efficiency Block Grant program. We don’t need better incentives, we need – as Matt says – better accounting. But we also need better financial models. As you mention, the high up-front cost and long payback is the stumbling block, so the solution is for local governments or utilities to buy the panels, install them on houses, and let the owners pay them back over time on their property tax or utility bill. The panels stay with the house if sold, increasing the sale value. This model is already in use in California, and could be here, if we wanted it. You could do this with any RE technology – solar, micro-wind, geothermal… you can do it with efficiency as well, weatherizing homes etc. as Matt suggests. All of this can be paid for with stimulus funds.